#10 X 5/8 Stainless steel phillips drive pan head self tapping sheet metal screws. Grade 18.8. Stainless steel pan head self tapping sheet metal screws are used mainly in sheet metal, wood, and plastic applications. Pan Heads have a rounded top, cylindrical sides and a flat bearing surface for any area that requires general purpose bearing. 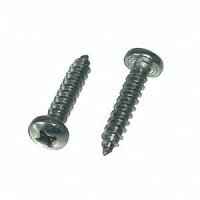 Pan Head screws can be substituted for round, truss, or binding heads in most applications.